Tetra is a forthcoming countertop dishwasher. Its collaborators, Heatworks and Frog, developed the compact unit to function with ease and efficiency; to install it you'll need only a footprint in your kitchen, and a single standard electrical outlet. No plumbing hookups are required. Tetra could be a dishwasher replacement in smaller households, or those that don't eat in very much. But with a capacity for just two full place settings (or 10 plates, or 12 pint glasses) it may serve better as a wingman to your existing dishwasher, and dishwashing process. Heatworks' research shows that people are hesitant to run their dishwasher, which typically holds 13+ complete place settings, before it's full. If they have just a few dishes in the sink, they either load them and wait until there are enough dishes to merit a cycle (enjoy that smell 3 days later) or handwash the dishes under the assumption this wastes less water. Heatworks says it doesn't. Handwashing a few dishes typically consumes 10 times more water than running a dishwasher. The Tetra countertop dishwasher uses about 1/2 gallon of water per load. You'll know because you'll pour in the water yourself before starting the cycle. For a 2-person household, this method could save 1,500 gallons of water per year. An internal detergent reservoir you can fill once for a few dozen cycles' worth of soap. Ohmic Array Technology, Heatworks' patented power source that uses graphite electrodes and electronic controls, which won't rust and scale over time like metal heating elements. The components are also able to heat water more directly, and give you more precise control over water temperature, so you can wash, or just sanitize, more delicate items, such as baby products, wine glasses, and plastic storage containers, without breaking or melting them. Tetra's temperature control expands its usage possibilities beyond washing and sanitizing. 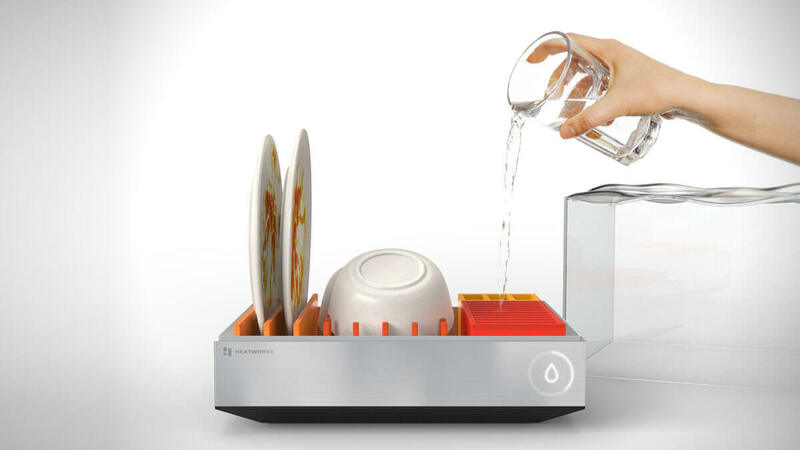 Heatworks says you can also use the dishwasher to cook seafood. Like, steam a lobster, I guess. Weird. Super fast wash time - just 10 minutes per load. 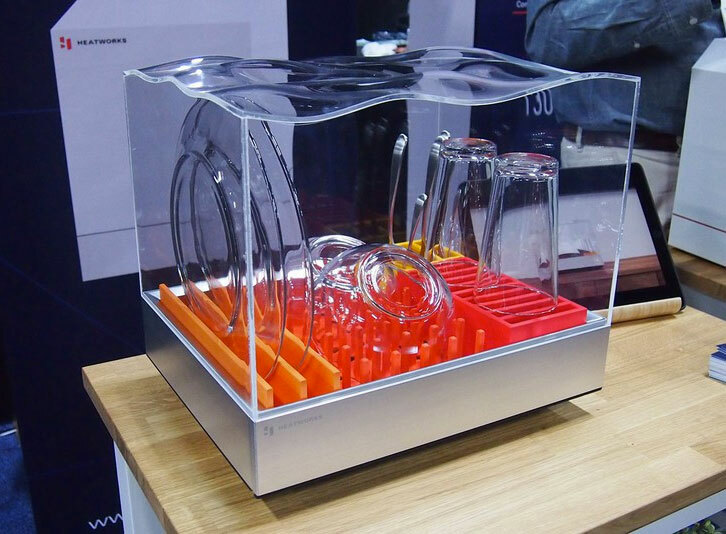 Heatworks debuted the Tetra countertop dishwasher at CES 2018, and anticipates releasing it by the end of the year. 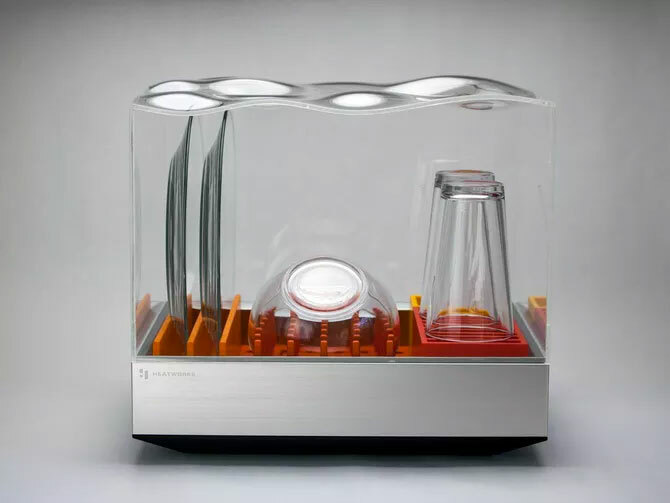 January 2019 Update: Heatworks returned to CES 2019 with the Tetra, and now the company's website reports that pre-orders for the countertop dishwasher will begin in Q1 of 2019.